Throughout the first half of the twentieth century, what is now downtown Tiburon was dominated by the Northwestern Pacific Railroad Company headquarters, ferry docks and repair shops. During those early years, serious fires damaged portions of the railroad yard and several homes, which led residents of the community to petition the Marin County Board of Supervisors for organized fire protection. 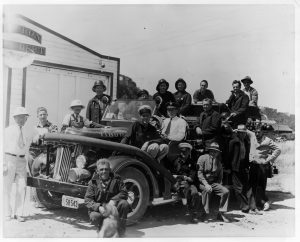 In April 1941, voters approved the formation of a new fire district for the Tiburon peninsula and elected three fire commissioners. The first roster of volunteer firefighters was comprised of seventeen men, many of whom were employed by Northwestern Pacific and lived on the hillside above the railroad yard. The new Fire District entered into a three-year lease agreement at five dollars per month for a fire station site at what is now 1690 Tiburon Blvd. The volunteer firefighters built a wood frame, two-stall engine house on the property. Emergency phones were installed in the fire station and in the homes of the Chief, Assistant Chief and Commissioners. Volunteers were alerted by the NWP air horn alarm system which could be actuated from any of the railroad alarm locations. In October 1941 they took delivery of a new White 500 GPM pumper built by the Van Pelt Company of Oakdale, California. In September of 1946, the District leased property from the Northwestern Pacific Railroad Company and moved the fire station across the street to the District’s current location at 1679 Tiburon Blvd. Another engine was purchased from Van Pelt in 1949 for fighting grass and brush fires on the peninsula. Radio equipment was installed in both trucks with Civil Defense matching funds. 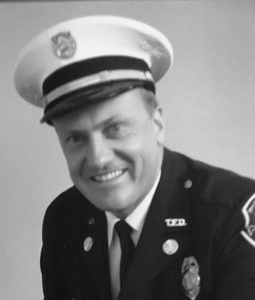 The District remained an all-volunteer fire department until December 1959, when Franklin J. Buscher was appointed as the District’s first paid Fire Chief at the age of twenty-five. Under Buscher’s leadership, new goals were developed for the department including an emphasis on training, improved records and standards of operation, and a systematic plan for building a full-time work force. The 1960-61 budget of $60,251 was enough to begin hiring firefighters and construct a substation in the northern section of the District. Clive Cloverdale became the District’s first paid fireman on August 1, 1960 and a new two-stall fire station was ready for occupancy at 4301 Paradise Drive the following month. The District experienced steady growth throughout the 1960s with the addition of equipment and personnel. By 1970, both stations were fully staffed 24/7 with five paid personnel each day – three at Headquarters and two at Paradise Drive. An increase in emergency medical calls in the 1970s led to a formal first aid training program for all personnel and the purchase of an ambulance. In 1979, voters approved the establishment of a Joint Powers Authority, the Southern Marin Emergency Paramedic System (SMEMPS), which significantly improved the level of pre-hospital emergency care for all Tiburon and Southern Marin residents. Firefighters from each Southern Marin Agency were trained as paramedics and performed dual services. Three ambulances, located in Tiburon, Tam Valley and Sausalito, provided basic life support (BLS) transport and were backed up by two paramedic/firefighters operating in a Rescue Squad station at the central Mill Valley Fire Station. During Buscher’s tenure, the Board of Directors committed the District to fire prevention by adopting the Uniform Fire Code. A rigorous home inspection program was developed along with annual business inspections. Requirements for new construction in Tiburon included fire alarm systems, roadway and hydrant installations. The endorsement of built-in fire protection and life safety systems was expanded in 1983 when Tiburon became one of the first communities in the state to adopt a 100% sprinkler ordinance which required the installation of automatic fire sprinkler systems in all newly constructed and substantially remodeled buildings. In 1981 the Tiburon Fire District contracted with the City of Belvedere, providing emergency medical and fire related services to the City. This contract added three additional personnel to the staff including a fire marshal and two firefighters. The Belvedere Volunteer Fire Department was merged with the Tiburon Volunteer Fire Department and the old Belvedere Fire Station was converted to a community center. 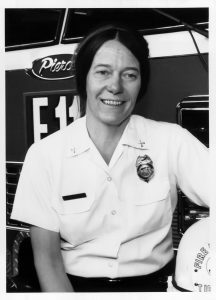 Chief Buscher was a leader of many statewide organizations and served as Chairman of the Marin County Fire Chiefs Association, State of California Fire Chiefs Association and as Coordinator for Marin County Office of Emergency Services. Among Chief Buscher’s many successes was spearheading the Countywide and Statewide Mutual Aid Systems that are still in use today. He retired in 1993 and Rosemary Bliss, the District’s Fire Marshal under Chief Buscher, was appointed as the next Fire Chief. Chief Bliss was instrumental in developing the long range financial plan for the District. A committee comprised of the District Board, Staff, Volunteer Firefighters and community members from both Tiburon and Belvedere worked to establish benchmarks for financial stability and to address potential negative effects on the District from both inside and outside influences. As a result of this planning the SMEMPS Operating structure was reorganized to better meet the needs of the Southern Marin area and address increasing demands on the medical delivery system. This model change, along with updating the contract with the City of Belvedere, were two of the many actions taken over the past several years that put the District on a solid financial footing. 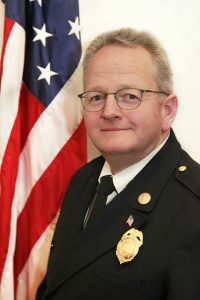 Chief Bliss also served as Chair of the Marin County Fire Chiefs Association and worked to create Countywide Fire Prevention Standards throughout Marin County. Under Chief Bliss, disasterpreparedness was given a high priority and after the terrorist attacks of 2001 the District applied for and received a FEMA grant for the purpose of training personnel and providing a disaster cache of equipment. Three members of the District were also added to the Marin County Urban Search and Rescue Team. long-range financial position was identified early, and potential impacts of the economic downturn at that time were addressed. Through planning efforts, action was taken by Chief Pearce and the Board of Directors to provide for the long-range capital, salary and maintenance needs of the District. These actions included establishing an Assigned and Unassigned Resource Policy to fund each category to the appropriate levels and to aggressively prefund future retirement obligations and other post-retirement benefits. A Committed Resource Policy was added during the 2016-17 fiscal year. These efforts have minimized the overall negative financial impacts to the District during the most recent economic downturn, while ensuring the Mission and Strategic Goals are met without further taxation on the constituents. Chief Pearce remains active in all local, state and national fire service organizations and currently serves on the Board of Directors for the Fire Districts Association of California. This involvement provides opportunities to influence and promote issues of interest to the District both financially and operationally, or to defeat issues that are contrary to its mission. Chief Pearce is committed to making the District a recognized leader in responsible local governance while setting standards of excellence in all-risk preparation, prevention and protection of our citizens and visitors. This is evidenced by expanding the response capabilities with additional personnel and apparatus such as a fireboat and rescue vehicle. These efforts have resulted in the lowering of the Districts ISO rating, which ultimately reduces the rates constituents pay for insurance. The District has embarked on bold initiatives such as the CAFR which provide benchmarks for excellence in administration, finance and operations of the District.